Compared are the shortened UK DVD by Stonevision Entertainment (BBFC 18) and the German Uncut DVD (SPIO/JK) by CMV-Laservision. The UK DVD lacks 18 seconds in 2 scenes. In the UK, three releases of that zombie classic by Lucio Fulci are available: the Uncut Version by Vipco on VHS and by Anchor Bay on DVD. The Uncut VHS by Vipco was put on the list of the video nasties. Furthermore there are two Cut Versions: one of them is 18 sec shorter and the other one 1 min 46 sec. The last version is equal to the Theatrical Version and was also put on the list of the video nasties. 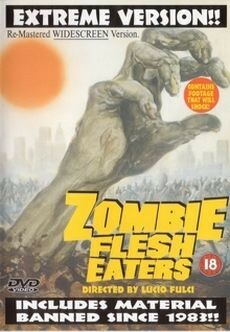 UK Version: Zombie Flesh Eaters / German Version: Zombie 2. Close-up of Paola's head being pushed forward. The protrudent wooden tip penetrates her eye. The UK Version only contains a few seconds oif the shot. Extended shot of the zombies eating Paola's corpse.